Face to face meetings can be great for getting together and working, but they can also often be a hassle. Getting everybody to the same place, having a room prepared and using new or unfamiliar technology can be annoying and time-consuming. Instead, many businesses have embraced online conferencing as the solution. Quick, simple to use and allowing you to meet face to face from the comfort of your own office, online conferencing is a solution that can save you time and money. Want to know more about how it can help your business? Read on for the top advantages it offers. Being on the move can be great for seeing the world outside of your office, but it's not so great if you want to stay in touch with it while you're away. With just a laptop or a smartphone, you can call into your workplace and stay in the loop with everything that's happening, giving you the best of both worlds. Online conferencing gives you an opportunity to plan for a structured meeting where you can plan the key agenda and important content for presentation. As a meeting host, you have a lot of control over what people see and who presents. Traveling to meetings can eat up time and money quicker than you could imagine. Once you've paid out for travel, accommodation and food allowances; that's a significant hole in your budget. Video Conferencing Advice points out that there's virtually no cost to bringing a team together online rather than physically, meaning that you can get together as often as needed. Modern day living means that often we can't be in the office 9-5, Monday through Friday. With many choosing to work from home due to childcare or other home concerns, online conferencing is the best alternative. Home workers can be in touch with the office as often as it is needed, without ever having to leave their home. A traditional meeting can take a long time to pull together and hold, reducing the time available for actually completing projects. Clear One notes that with video conferencing, meetings are conducted much faster, and so projects can be completed in a much shorter time frame. Many businesses now are no longer constrained to one single base. Many are spread out across the globe, improving your business's reach but potentially impacting communication between branches. Online conferencing means that you can keep in touch with all of your colleagues, making sure everybody is always on the same page. A traditional meeting can be recorded by taking minutes or setting up video equipment in the corner of the room, but these methods can be cumbersome and time-consuming. Video conferencing allows you to record a whole meeting from start to finish, letting you come back to the recording to check details at any time. Conference Group argues that online conferences mean that a meeting can happen and acted upon while a face to face meeting is still in its planning stages. When time is of the essence, who has time to be hanging around waiting for the meeting to happen? Get right down to it, then get to work on the results when it's done. Traveling for work can be a welcome break from the norm, but when it's happening regularly it can begin to grind you down. When that happens, your work often suffers. Online conferencing allows you to maintain a good work-life balance, meaning that no area of your life is suffering and you can continue to give it you're all in whatever you do. Because online conferences are usually short, they can be arranged quickly, on the fly. Have a question about a product you've been collaborating on? Call the other person and meet up to discuss it and then get back to what it was you were doing. You can talk to your teammates without interrupting your work flow. 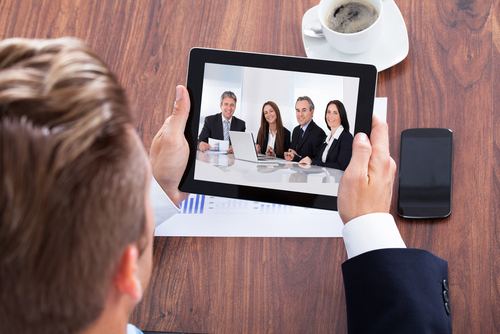 VideoNations describe media sharing as a benefit of online conferencing. If you have files to show others, such as a presentation or report, you can show them over the conferencing software direct from your computer. Everyone can have access to your media with just the click of a button. Being able to see each other while you're talking is a great advantage of online conferencing. You can pick up on subtle nonverbal cues and hand gestures, meaning that communication will be much more effective. If you've been convinced that video conferencing is for you, then you're in luck. Along with the wealth of companies like Bluejeans that offer online web conferencing and others allow you to look around and find one that's a good fit with your company's needs. Before long, you'll find that it's saved you a great deal of time and money, and your business will be much more productive as a result. Updated on November 2016 to fix minor problems and add more advantages.